“‘Facebook has sparked open warfare in dotcom land’” (The Telegraph; 2011.05.13) – http://www.telegraph.co.uk/technology/facebook/8512730/Facebook-has-sparked-open-warfare-in-dotcom-land.html – A leading public relations executive has defended Facebook’s recent attempt to smear Google in the US press using a top PR firm, saying dirty tricks are not unusual. “Human Brain Limits Twitter Friends to 150” (The Physics arXiv Blog; 2011.05.30) – http://www.technologyreview.com/blog/arxiv/26824/ – The number of people we can truly be friends with is constant, regardless of social networking services like Twitter, according to a new study of the network. Abstract: Modern society’s increasing dependency on online tools for both work and recreation opens up unique opportunities for the study of social interactions. A large survey of online exchanges or conversations on Twitter, collected across six months involving 1.7 million individuals is presented here. We test the theoretical cognitive limit on the number of stable social relationships known as Dunbar’s number. We find that users can entertain a maximum of 100-200 stable relationships in support for Dunbar’s prediction. The “economy of attention” is limited in the online world by cognitive and biological constraints as predicted by Dunbar’s theory. Inspired by this empirical evidence we propose a simple dynamical mechanism, based on finite priority queuing and time resources, that reproduces the observed social behavior. “Dunbar’s Number is a well-known concept in anthropology, which states that an individual can only maintain strong stable relationships with around 150 people. The number is held to be a function of the size of the neocortex, a theory tested by comparing the social groupings of other primates. Some people claim that any group loses cohesion and eventually its identity when its size exceeds Dunbar’s number. “There is a need to double the Dunbar number to at least 300 to reflect the realities of the new hyper-connected Web 2.0 world. Will you dig that? “You see, monkey experts performed a monkey study a while back, and discovered that the size of the monkey’s monkey brain determined the size of the monkey groups the monkeys formed. The bigger the brain, the bigger the little societies they built.They cut up so many monkey brains, in fact, that they found they could actually take a brain they had never seen before and from it they could accurately predict what size tribes that species of creature formed. “Essentially, as we increase group sizes beyond 80, to 150, 200, or even 350-500, we typically do so by breaking larger groups down into smaller ones, and continually reducing community sizes down to the point where they can be understood and managed by people — and so efficiency reasserts itself.In my experience and vision of communities of practice, I tend to find similar numbers floating around. Typically vibrant communities of practice have around 100 – 150 members. As social structures, they are “onion-shaped”, with layers of membership behaviors. The size of person’s amygdala either pre-determines, or is a consequence, (or correlates from some unknown reason), the size of persons social circle. 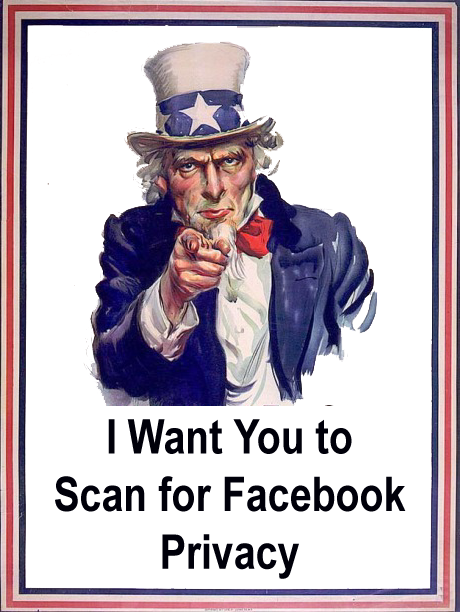 "I want you to scan for Facebook privacy"